It was certainly apparent to [Jan] Oort right away . . . right away he saw it as a tool for learning something about the structure of the Galaxy. Gauss and Bessel lived at a time when mathematicians doubled as physicists and both men knew that Newton had displayed the colors of the rainbow by passing the Sun's light through a prism. Yet neither saw the Sun's light or the light from other stars as a source of "proper knowledge" about celestial bodies. It's as if one sought to understand the workings of airplanes by determining their weight and shape, and by recording their position in the sky. In their pronouncements, Gauss and Bessel could not have been more wrong. As Gauss and Bessel must have known, the Earth is awash with radiation from space. The most obvious, of course, is the visible light that radiates from Sun to Earth. Then there is the light from the twinkling stars that adorns the night sky. Invisible radiation was discovered between 1800 and 1801 in regions beyond both the red and violet ends of the Sun's visible spectrum. How far radiation extended into the long and short wavelengths beyond the visible regime was not known, but it certainly was established that the Sun's visible spectrum represented only a part of its radiation. Furthermore, it was observed in 1802 that the rainbow spectrum from the Sun had breaks, or dark lines, embedded in it which hinted that the radiation transmitted some type of information from Sun to Earth. So, a lot of things were happening around 1800—right under the intellectual noses of Gauss and Bessel. By the middle of the nineteenth century, it was recognized that the radiation emitted by the Sun and other stars could provide information about their chemical composition through an analysis of their spectral lines. Our understanding of stars—how they are born, live, and die—has come from the classification of stars by virtue of the different types of spectra observed in the radiation that enters our laboratory apparatus from these far-off spangles in the night sky. From that time to the present, scientists have pushed toward investigating both longer and shorter wavelengths to determine what new information can be gleaned from stellar radiation (see Figure 17.1). Figure 17.1 Sunlight is simply electromagnetic radiation that our eyes detect. The wavelengths in this fraction of the spectrum are shown as the vertical letters "Vis." This chart of the electromagnetic spectrum also shows waves with shorter wavelengths (ultraviolet, X-rays, and gamma rays) as well as longer wavelengths (infrared, microwaves, short radio waves (TV/FM), and longer radio waves). adopted wavelengths at about fifteen meters in length for ship-to-shore and transatlantic communication. Unfortunately, there was interfering static that reduced the quality of communications, so Jansky was asked to examine this problem. Specifically, he set out to find the source of the static hiss—a challenging applied-physics assignment typical of those confronted by scientists in industrial laboratories. Waves Traced to Center of Milky Way." Americans tuned their radios to a station that was connected directly to Jansky's antenna and the radio announcer told listeners, "I want you to hear for yourself this radio hiss from the depths of the universe. "3 Jansky's 1933 talk in Washington, D.C. is generally regarded as the beginning of radio astronomy. As stated, good luck and serendipity were prominent in Jansky's discovery. It just happens that the galactic center emits copious amounts of radio waves at the particular range of wavelengths Jansky was investigating. It just happens that the Earth's atmosphere is transparent to this same range of wavelengths so the signal reached his antenna. It also just happened that Jansky was working during a sunspot minimum. At sunspot maximum, these radio signals "from the depths of the universe" would have been blocked by the Earth's ionosphere. The response to Jansky's discovery of radio waves was muted in the technical community because scientists regarded this new discovery as a curiosity. Few physicists followed up on Jansky's work and astronomers showed little interest. Two reasons explain scientists' indifference. One reason was that the equipment needed to examine radio waves accurately was lacking. This changed with the end of World War II when advances in electronic devices, designed for the long wavelengths used in radar systems, became available. The second reason was that Jansky's observation was akin to what is heard when members of a symphony orchestra, all sitting in their proper places, are warming up. A cacophony of muted sound fills the concert hall as the instrumentalists independently go through their warm-up drills. Jansky's detected hiss was the product of radio signals with a range of different wavelengths. Like the orchestra warming up, there was no clean signal. This too was soon to change. As we learned in Chapter 1, most of the material in the universe is hydrogen. Far and away, most of the interstellar gas is hydro gen. Those hydrogen atoms located near hot stars typically have their electrons stripped from them and they exist in ionized form. A small fraction of the hydrogen, about 1 percent, exists in molecular form—two hydrogen atoms chemically bonded together. The rest are individual hydrogen atoms, approximately one in every cubic centimeter throughout interstellar space. Shortly before World War II ended, a Dutch astronomer, H. C. van de Hulst, predicted that these atoms of hydrogen might be detected by looking for a particular telltale signal. This signal would have a frequency of 1,420.4026 megacycles per second (Mc/s) or a wavelength of 21 centimeters (cm) and would arise from a particular spectral transition between two states of hydrogen. This particular quantum transition later rose to stardom in the world of physics. It was the same transition that Rabi and his students, shortly after the war, found to be at odds with Dirac theory, and it was this transition that led to a new value for the electron's magnetic moment. By 1947, this transition had gained prominence from an experiment on earthbound hydrogen atoms; soon this same transition would assume galactic significance. Also, this same transition would become the basis for the most accurate atomic clock, which was developed in the late 1950s (discussed in Chapter 18). A few years after van de Hulst's prediction, scientists in Holland began to prepare an experiment to determine whether, in fact, this spectral transition with its wavelength of 21 cm could be detected from hydrogen atoms located in the depths of space. Unfortunately, a fire in their apparatus set them back and, with the passage of time, their opportunity for the original discovery was lost. As we shall see, however, fate eventually smiled on the Dutch group. Figure 17.2 The horn antenna used by Purcell and Ewen in their discovery of the hydrogen 21-cm line. periment to scan the sky for this hydrogen signature—the particular wavelength of 21 cm. Neither Purcell nor Ewen knew that the Dutch group was in the process of preparing the same experiment. The Harvard experiment was carried out with meager funds. 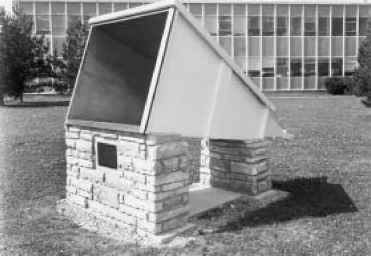 The budget of $500 was spent to construct a plywood antenna that had a rectangular cross-section and expanded from its neck like the bell of a strange-looking musical instrument. The antenna was designed to receive and detect the 21-cm line from hydrogen atoms in the extreme cold of outer space. (The original telescope constructed at Harvard is shown in Figure 17.2. It is exhibited at the National Radio Astronomy Observatory in Green Bank, West Virginia.) The rest of the equipment was borrowed. By the spring of 1951, the experiment was ready to go. Records do not exist that reveal how many fruitless nights were spent trying to detect the 21-cm line. In fact, at one point Purcell and Ewen decided to abandon hope of finding the line, but continued in order to make the negative results sufficiently convincing. It was during this period, on the night of March 25, 1951, that the hydrogen line was first detected. The signal came from hydrogen atoms in the constellation Ophiuchus located toward the center of the Milky Way. The source of this first signal was a cloud of hydrogen atoms extending across some 3,000 to 5,000 light years. With the discovery of the 21-cm line of hydrogen, the young field of radio astronomy entered a new era. Suddenly, it was as if a maestro had arrived on the podium, the cacophony ceased, and a sweet tone, pure in character, came from the orchestra playing as one. 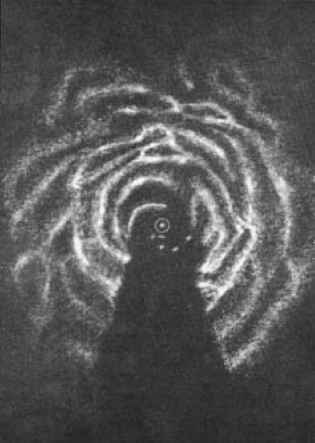 In "Doc" Ewen's horn-shaped antenna the static hiss of random radio waves from outer space was replaced by a pure tone from hydrogen atoms. The pure tone had a frequency "around" 1,420 Mc/s with a wavelength of 21 cm. It just happened that van de Hulst was at Harvard as a guest lecturer at the very time the experiment succeeded. Also at Harvard, by happenstance, was Frank J. Kerr from the radio astronomy group in Australia. Kerr tells what happened: "Purcell called us [van de Hulst and Kerr] all together on the morning after the overnight discovery. Cautious scientist that he was, he wanted to see confirmation of the detection before publishing the result. He suggested that van de Hulst and I should cable our respective institutions in Holland and Australia to report the discovery and ask whether early confirmation would be possible. "4 Purcell and Ewen sent an announcement of their discovery to the journal Nature, but Purcell asked the editors to hold up publishing the result until the Dutch and Australian groups could reproduce the results. The Dutch group was able to confirm the results quickly. The Australian group verified the finding in six weeks. The results of the discovery were eventually published from the three groups—American, Dutch, and Australian—simultaneously in back-to-back papers in the September 1, 1951 issue of Nature. Such was the character of Edward M. Purcell. How many scientists, one might ask, would delay publication of results so that others could share in the glory? Purcell was an unusual physicist, displaying none of the ruthlessness often found in men and women of ambition. Instead, kindness and consideration for others emanated from him. "Doc" Ewen also had to have been part of the decision to share the honor with the Dutch and the Australians. Ewen was a little more senior than the typical graduate student since he had served in the Navy during World War II. In the Navy, "Doc" was an instructor of celestial navigation. One of his students was Ted Williams, the great Boston Red Sox baseball player, who was a Navy pilot. During the Purcell-Ewen experiment, Ted Williams visited the Harvard physics laboratory to see "Doc" and to see the experiment firsthand. As Purcell later reported, the famous physicists at Harvard "were all aflutter" with the great Ted Williams in their midst. Whether it was his maturity, his service in the Navy, or the influence of Purcell, Ewen also deserves credit for sharing the honor of the discovery. Both Purcell and Ewen knew their discovery was very important. One indication of its importance is that Purcell and Ewen have been incorrectly credited with winning the Nobel Prize for this work. (Purcell won the prize for his discovery of NMR.) No one can say, but it is possible their unselfish act of sharing the discovery with the other two laboratories deprived them of added honor. It is interesting to note that a year before he died, Purcell confided to one of his most illustrious students, Nicolaas Bloem-bergen, that he regarded his contributions to radio astronomy to be at least as significant as his discovery of nuclear magnetic resonance.5 The discovery of the hydrogen 21-cm line opened possibilities for gaining new knowledge about our galactic neighbor hood as well as the universe far from us—detailed and surprising knowledge. The Sun with its nine planets is about 30,000 light years from the center of a large complex of stars we call the Milky Way—our galaxy. In spite of being a resident of this galaxy, we knew little about its structure, for it was rather like trying to determine the shape of a forest while standing among the trees. In addition, interstellar clouds of dust and hydrogen block visible light so scientists were unable to observe structural characteristics of the central regions of the Milky Way with optical telescopes. Radio waves, by contrast, are not blocked by these clouds. In fact, these interstellar clouds of hydrogen can be mapped by the 21-cm line. Figure 17.3 The Milky Way as seen by the hydrogen 21-cm line. so those hydrogen atoms moving away from the radio antenna are shifted to slightly longer wavelengths (red shifted) and those moving toward the antenna are shifted to slightly shorter wavelengths (blue shifted). It is from these Doppler-shifted data that both the motion and the location of the Milky Way's spiral arms can be determined rather precisely. Beyond the Milky Way, the Clouds of Magellan, the galaxy closest to our own, have been observed by means of the hydrogen line. To the surprise of astronomers, this galaxy is bigger than it appears when viewed through optical telescopes. The red and blue shifts observed with the hydrogen 21-cm line further reveal that the Clouds of Magellan are rotating. 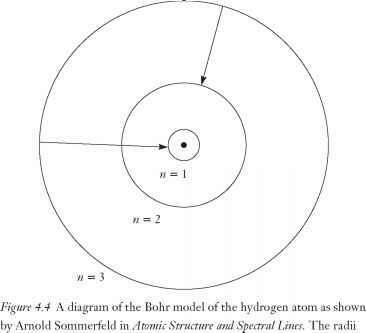 The hydrogen atom burst open the field of radio astronomy. Today, radio astronomical observatories are located at strategic sites in many nations of the world in both hemispheres. Scientists in these observatories are actively listening to the radio signals emanating from sources within the Milky Way and from the further depths of space. Many sources of radio waves have been identified that build our knowledge of the greater universe. Hydrogen atoms are ubiquitous throughout the physical universe. Where these atoms exist in neutral form, such as between stars and perhaps between galaxies, they have the potential of emitting a 21-cm radio wave. On average, a hydrogen atom emits a 21-cm photon every 133 years. If we assume that there is approximately one hydrogen atom in each cubic centimeter of space, this means that the characteristic signature of the hydrogen atom leaves each and every cubic meter of space approximately sixty times each and every year. Some of these radio photons are emitted in the direction of the Earth, and when scientists choose to listen, their instruments hear a special form of music revealing information that only nature's provocative hydrogen atom can provide.